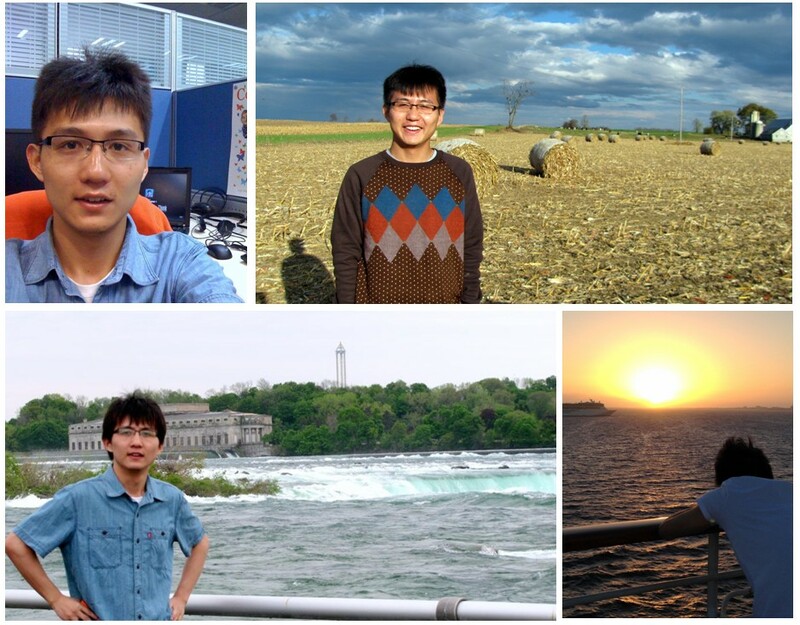 Welcome to the personal homepage of Xiang E. Xiang, a PhD candidate at JHU-CS! Since 2017 I have moved my homepage to Google Sites for persistent updates in the future. Please refer to https://sites.google.com/view/xxiang for my status quo! A glance at my interest in emotion & video analysis and feature & stereo matching. [2016/08] Scheduled to give a presentation at Disney Research Pittsburgh Vision Group meeting. [2016/07] Having an advising meeting with Gregory Hager, Austin Reiter and Smith Scott to figure out a plan for dissertation work and supportive publication. [2016/06] Attending Polina's Reading Group at MIT CSAIL. [2016/05] Attending MACV 2016 with Haibo Wang from Philips Research North America. [2016/04] Testing the pre-trained VGG_Face deep model. [2016/02] Continuing working on robust recognition at Philips Research yet with deep features. [2016/01] Having a retreat full of self-reviews and discussion at Gregory Hager's house. [2015/12] Having a Christmas party at Trac Tran's house. [2015/11] Testing the pre-trained LSTM deep model on UCF 101. [2015/05] Joining a UCSD-based startup Emotient. See how deep learning is applied here. [2014/03] Attending the workshop MACV in April at Virginia Tech with Hao Li. [2013/01] ACCV'12 official paper is available at Springer: full paper and one-page summary. Ph.D. Candidate in Computer Science, Dec. 2014 - present. Ph.D. Student in Computer Science, Sept. 2012 - Nov. 2014. M.S.E. in Computer Science, awarded on Aug. 2014. M.S. in Computer Science, Sept. 2009 - June 2012. Homepage. Thesis: Human Tracking and Segmentation in Dynamic Scenes. Graduation. B.S. in Computer Engineering (ranked 2nd/392), minor in Finance, Sept. 2005 - June 2009 Exchange student at Osaka University, Osaka, Japan, Sept. 2008 - Feb. 2009. Graduation. Fields of interest: image processing and machine learning. Speciality: 3D and mid/high-level vision techniques for video-based visualization and recognition. Methodology: problem modeling, being handy with novel methods and building useful systems. Feb. 2014 - present, Exploring sparsity and low rankness for action/event recognition(demo), with Trac Tran. Jan. 2014 - , Connecting stochastic bundle adjustment to visual SLAM (demo), with Gregory Hager. Sept. 2013 - Dec. 2013, OOSE group project: Topic-Oriented Social Network - Topica (live online). Sept. 2013 - Dec. 2013, T.A. for Computer Vision, advised by Rene Vidal. Sept. 2012 - May 2013, R.A. for endoscopic reconstruction (NIH grant), advised by Gregory Hager. Jan. 2013 - May 2013, course project on uncertainty of feature matching (poster), Russell Taylor. Jan. 2013 - May 2013, course project on CRF for stereo matching (poster), advised by Suchi Saria. Jan. 2012 - May 2012, R.A. for phase recognition, T.A. for Computer Vision. Sept. 2010 - Feb. 2012, R.A. on porior learning for segmentation, with Xilin Chen and Hong Chang. Feb. 2010 - May 2010, R.A. for texture segmentation (973 project), Xilin Chen and Luhong Liang. Jan. 2010 - May 2010, T.A. for Machine Learning, advised by Hong Chang. June 2010 - Aug. 2010, R.A. for image registration, advised by Ichiro Sakuma. Sept. 2008 - Feb. 2009, R.A. for figure-ground segmentation, advised by Yasushi Yagi. Mar. 2008 - July 2008, R.A: realtime tracking camera (DSP-level), Natl. Embedded System Contest. Feb. 2008 - June 2008, T.A. for Discrete Math. Representation for Emotion Recognition. IEEE ICASSP, Brisbane, Austrilia, 2015. Recent Trends in Computer Vision (Post CVPR'14 AC meeting workshop), College Park, USA. ing Objects in Videos. ACCV 2012: 134-146, Daejeon, Korean. [Slides]. 2011: 11-22, Lake Tahoe, USA. Xiang Xiang: An Attempt to Segment Foreground in Dynamic Scenes. ISVC 2011: 124-134. Shift. ISPA 2008: 417-421, Sydney, Austrilia. Reviewer for IEEE ICIP 2011, 2012, IEEE ICME 2012, IEEE ICRA 2014 and MICCAI 2015. Student memeber of IEEE and IEEE SPS. Volunteer for ACM Multimedia 2009 and ACM ICMI 2010. The Johns Hopkins University and its Department of Computer Science does not screen or control the content on this personal website and thus does not guarantee the accuracy, integrity, or quality of such content. All content on this website is provided by and is the sole responsibility of the person from which such content originated, and such content does not necessarily reflect the opinions of the university and the department.